The latest Windows Phone data shared by AdDuplex is showing that there are quite a few unannounced Windows Phone 8.1 handsets currently in use. The most important among them is a new Nokia Microsoft Lumia device that seems to have three different model numbers: RM-983, RM-984, and RM-985. Apparently, the handset sports a 5-inch display with 720 x 1,280 pixels, so it might be a mid-end alternative to the Nokia Lumia 930 / Icon (which features a 5-inch 1080p display). This 5-inch Lumia may be one of the three new Nokia handsets that we told you about earlier this week, which are codenamed Vela, Athena, and Libra. Of course, it could also be a totally different device. Among the unannounced Windows Phone 8.1 handsets that were spotted in AdDuplex's system there’s also a “Lenovo QRD8x26.” Unfortunately, there are no details about the QRD8x26 at all, but this might be Lenovo’s first WP handset, which is expected to be announced before the end of the year. Other upcoming Windows Phone 8.1 devices are: LONGCHEER Fly-IQ400W, JSR JSRI7BV1, JSR I7B_1000, Honeywell BLUE PARIS, K-Touch Tianyu5703A3, and K-Touch Tianyu5705A2. These names don’t really tell us anything, but they’re all products made by Microsoft’s new (and lesser-known) hardware partners. We'll keep an eye on this, and let you know when these new WP 8.1 handsets are announced. I hope WIndows follows the path Blackberry is ATM.. Allowing apps from Windows and the Play Store. I would actually want to buy the 930 but Windows is just too limited. I hope Microsoft continues with unified apps on desktop, tablet and phone and continues to separate itself completely from Google. Windows Phone is amazing, even on the Lumia 520. I look at these articles and think... I'm not waiting for an article to say "This is an awesome flagship device" NO. 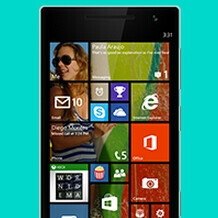 There are already some very attractive and capable windows phones. I particularly like the 1020 and the 1520. The 930 looks thick and uninspiring. I guess what I'm waiting to learn is that the windows ecosystem and app store is more fleshed out and more mature. Microsoft needs to get more developers on board. I guess it's a chicken or egg scenario. Windows phone adoption won't increase until more apps come to windows. And developers won't make more apps for windows unless they see a spike in adoption. Android was in this phase before and increased adoption by offering things that Apple didn't. Microsoft needs to figure this out quickly. I guess nokia and the camera optics is a good start. Is it enough? Not for me. To unified apps - Oh Hell No! Windows Phone may be amazing, but what's happened to the PC side of the strategy is a mess. I'm not just talking about Win8 - Office, for instance, has been re-tooled along this philosophy to such a degree that the only way you could love it is to be a Windows Phone user. If they keep this up they will drive me to Mac or Linux. I'm using office 2013. Yes, it's mouse friendly. But while some of the UI theme has carried forward from previous versions, other parts of the UI have been dramatically altered and redesigned. And one of the things that hasn't carried forward so well is stability and performance. It's changed so much that it might as well be a new set of tools - a Linux migration would be no different. That said, I'm not sure you understand why MS is #1 in enterprise - it really has little to do with software ease of use. I rather want an appstore for .exe programs. He's a blasphemer. Seriously why would want that? Unless you like a subpar experience. Fuq Google Play. Keep Windows MS or I get an HTC M8. Not the lack of apps is the problem. The store does not handle the categories well. There is more then 250.000 apps in the store, with thousands of different games. Till they fix the store i would suggest everyone to follow an app publisher site, for example wpcentral. Then instead of scrolling threw the same apps, just search for the ones you want. Everyone uses the top apps, on the play store top apps are chosen by the amount of recent downloads, interests, feedbacks, income, and ads. Meanwhile on the wp store it looks like they only use the amount of overall downloads, and ads. People run into the same apps they did not installed earlier for a reason it's just a circle where the most downloaded apps are always there, and the store looks to be much smaller than it is. It's not small, just you can't imediately find the new apps. He means that the search function in the app store is broken. Find a good developer or a dedicated site (wpcentral or aawp), and they'll link to the latest and greatest. As mentioned elsewhere, there are several hundred thousand apps for WP, so hardly limited...! The name of the lenovo phone is an inside call. QRD contains the operating system, the name, and the resolution. The 8x26 is a chipset snapdragon 8226 the same used in the lumia 630, and the moto G. By the way i hope they keep up the good work, but giving up the build quality for a 3rd party device hell no i'am sticking with nokia. I may actually try my first windows phone when the next round of flagship phones come out. LOL says the nickname of who? Right because that tells who I am and what I've bought. Get away knat, I currently have a S5 with a neo hybrid spigen case. Like you was a fan of bill gates and what he has done outside of work, long before I owned a lumia device, while I was still sporting a Galaxy and other droids (including a tablet). If Apples as smart as I think they are, they better get in on this 5 inch screen biz. That Lumia looks delish. Aaaaaaaand when is Windows Phone 8.1 rolling out? Getting kinda impatient. And please Microsoft just be buddies with Google enough to get them to make official Google services apps on WP..... This is getting ridiculous. You can get 8.1 on any Windows phone 8 device right now. The only Lumia I'm interested in is the successor to the 1020. + from here, but only if it comes with adequate storage!